Broke the news on air tonight. 4,000 word cover story on FBI translator turned whistleblower Sibel Edmonds in The American Conservative to hit stands and web tomorrow, by former CIA agent Phil Giraldi. There’s a new issue of The American Conservative going to press today, and it includes a story that will make more than a few congressmen and foreign lobbyists intensely uncomfortable: an in-depth interview between Phil Giraldi and FBI whistleblower Sibel Edmonds. She tells us exactly how Turkish intelligence have penetrated national secrets, suborned government officials, and blackmailed Congress. It’s going to be explosive. Good. Rightwingers are covering it. So hopefully that means the "liberal media" will now pay attention! UPDATE 9/18/09 1:15pm PT: Sibel posted the cover over at her site, and I've added it above. She also notes that the story is currently online available online to subscribers only until Monday when they'll release "a major press release" along with the print version out the same day. The story should then be available to all online on Tuesday. 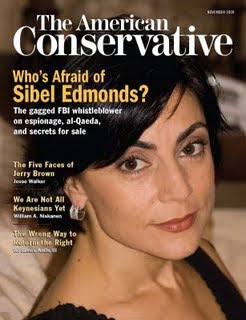 The cover title: "Who's Afraid of Sibel Edmonds? : The gagged FBI whistleblower on espionage, al-Qaeda, and secrets for sale"
In an email she just sent me just now, she notes: "We've been getting foreign MSM inquiries; tons. Zilch here; so far..."
Sudden death for the U.S. dollar! Is another 9/11 set to unfold?